Newborn Evie is held by her big sister Hannah. 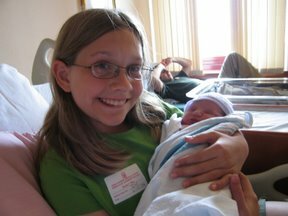 Evelyn McAdam Tsiopanos was born June 24, 2006 in Annapolis, Maryland to Steve and Brenna Tsiopanos. Sotirios Dimitrios Tsiopanos 1977 - ? Brenna Lee McAdam 1978 - ? Last Modified: 3 August 2006 by Bradley James Wogsland.